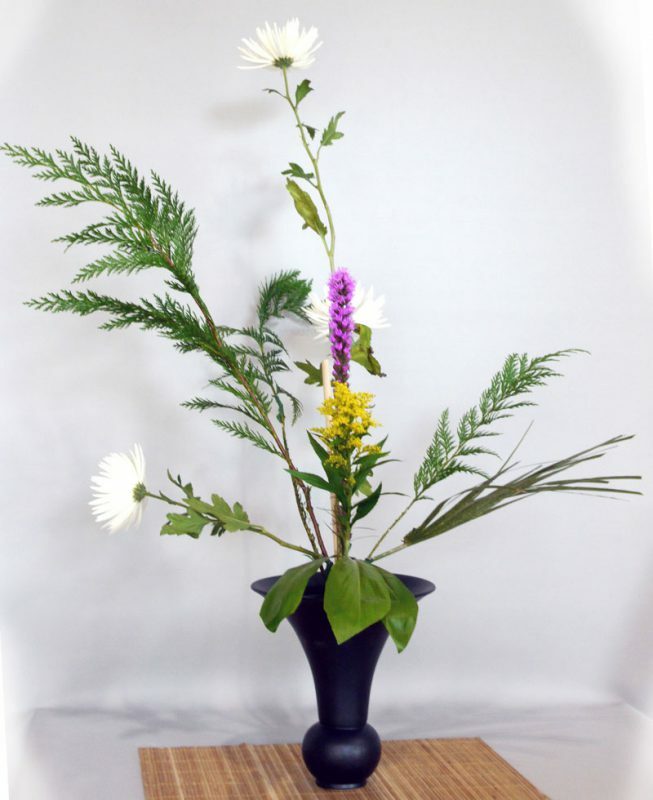 Ikebana is the ancient Japanese art of flower arranging. 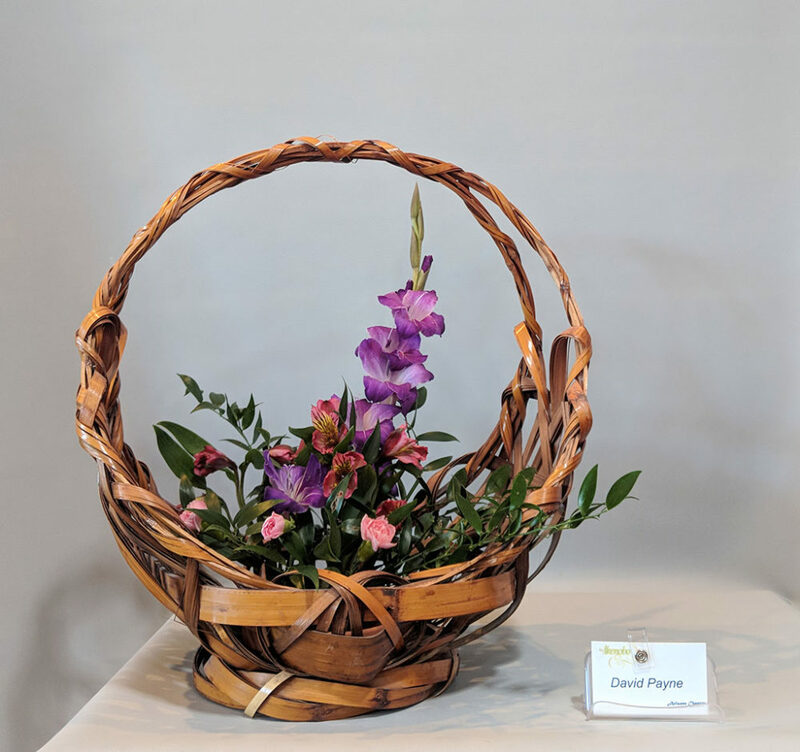 The name comes from the Japanese ikeru, meaning “to arrange” and bana meaning “flower.” Over 550 years ago ikebana had its beginnings by a pond at Kyoto’s Rokkakudo Temple where Ikenobo Senkei was recognized as a master of flower arranging. Today the 45th generation Headmaster, Sen’ei Ikenobo, continues to stress the inherent nature of plants, shussho. 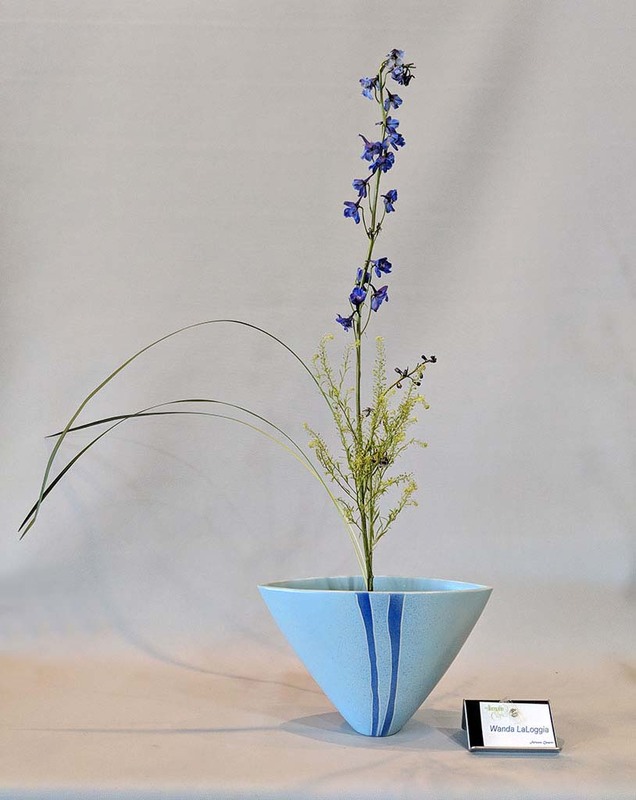 The Arizona Chapter of Ikenobo Ikebana was founded in 1964 and was officially chartered in 1974. 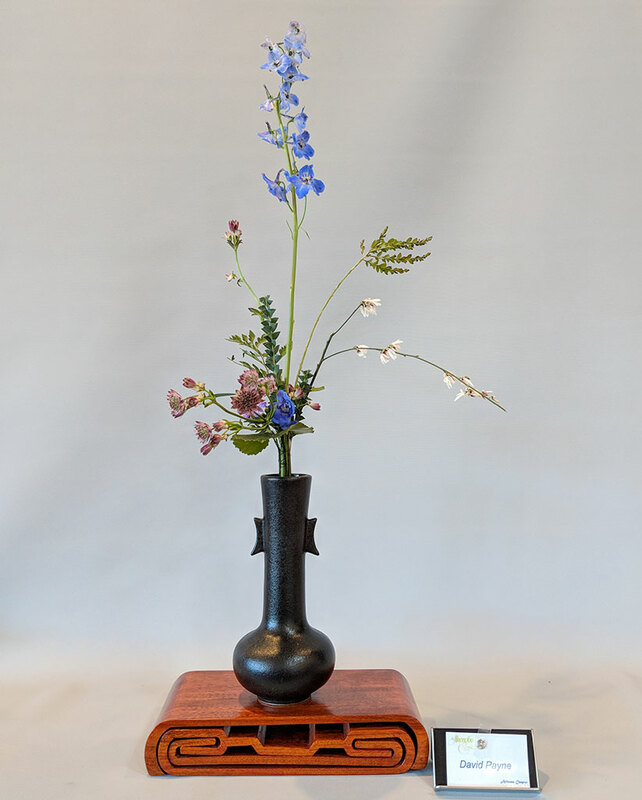 The goal of our Arizona Chapter of Ikenobo Ikebana is to continue to strengthen our already established ties with organizations in the community, including other ikebana groups and floral societies, Phoenix Art Museum, and the Japanese Friendship Garden. Through these outreach efforts we plan to increase membership and encourage the study of ikenobo and the development of teachers. Most of our workshops are held in Scottsdale. Our new location has a lovely Japanese garden that students can enjoy while working on their arrangements. All floral material is included. Once a year we hold a special workshop at the Mesa Community College Rose Garden. This workshop includes a tour of the garden by our Sensei (instructor) and Rose Curator, Marylou Coffman. In March our workshops are led by a visiting professor of Ikenobo from Japan. These unique workshops fill up fast, so get your reservations in quickly for this very special workshop. View our Calendar for a complete schedule. You may find you love Ikenobo so much that you want to become a sensei (teacher)! As a member all your classes are credited toward certificates. 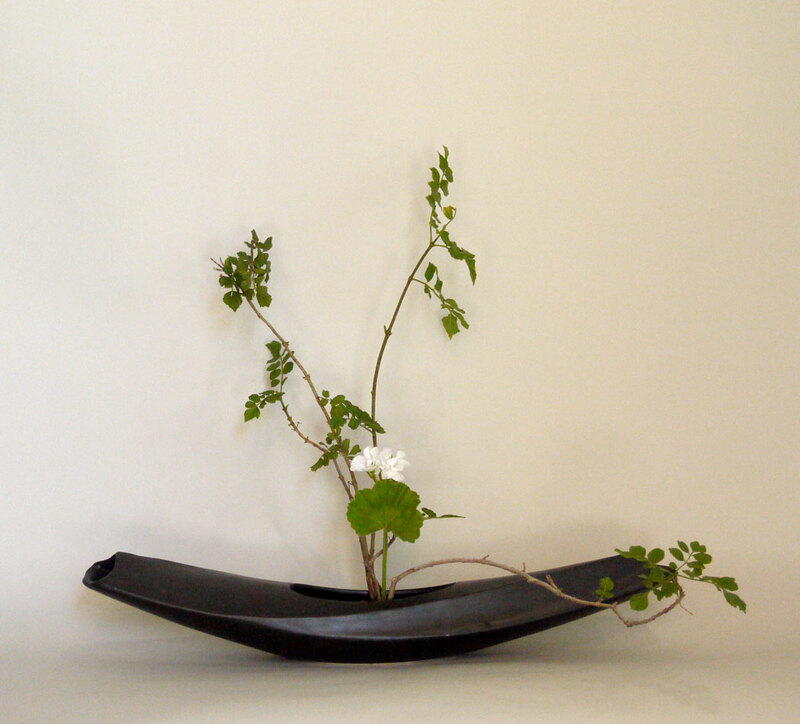 You will have access to monthly ikebana workshops, including those taught by high-ranking US-based teachers and visiting professors from Japan; a copy of Hana No Arakaruto, the annual Ikenobo magazine; and other benefits. Ikenobo is the origin of ikebana, the oldest school, dating from 1462 when Ikenobo Senkei arranged several dozen branches in a golden vase and drew admirers from all around Kyoto. While all ancient peoples had used flowers as offerings, it was only in Japan that the placing and arranging of flowers became codified as kado, the flower path, and developed into the art form of ikebana. The practice of placing flowers as an offering in Buddhist temples had come to Japan from China in the sixth century; thereafter, flowers were arranged for enjoyment or for healing and later for room decorating. 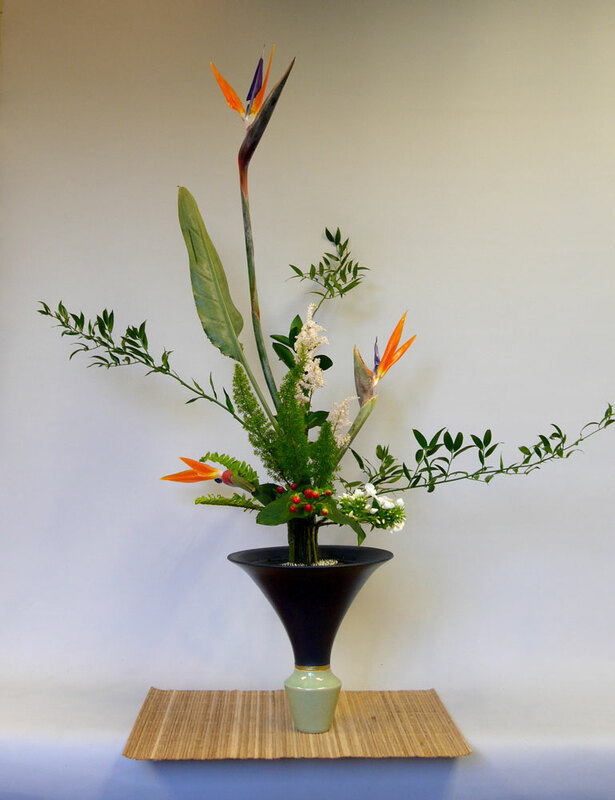 The earliest “standing flower” arrangements, tatehana, gave rise to rikka , originally a seven-branch style placed in the tokonoma of a Japanese drawing room. Rikka became increasingly complex over the centuries until, by the eighteenth century, it gave rise to an abbreviated style called shoka; today Ikenobo teaches rikka, shoka, and free style, or jiyuka. The very essence of Ikenobo is its strong emphasis on shussho, the inherent nature of plants and how they live. The current headmaster, Sen’ei Ikenobo, has continued to create new styles of rikka shimputai and shoka shimputai and to further the development of free style arrangements. Ikenobo continues its over five hundred years of development by teaching styles with ancient roots which harmonize with contemporary life. 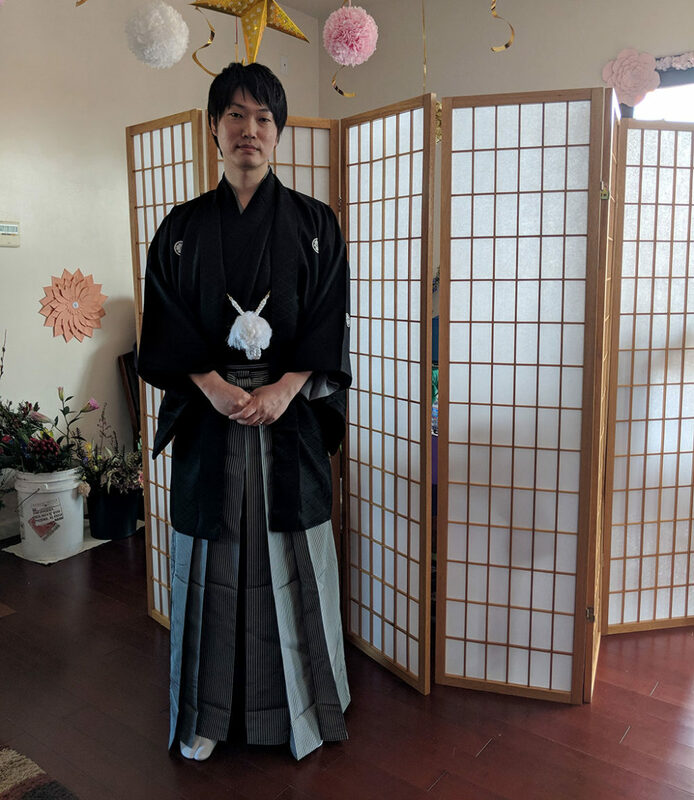 To follow Ikenobo’s flower path, one need only choose a certified teacher who oversees the course of study, including workshops, individualized lessons, and the study of Ikenobo texts. 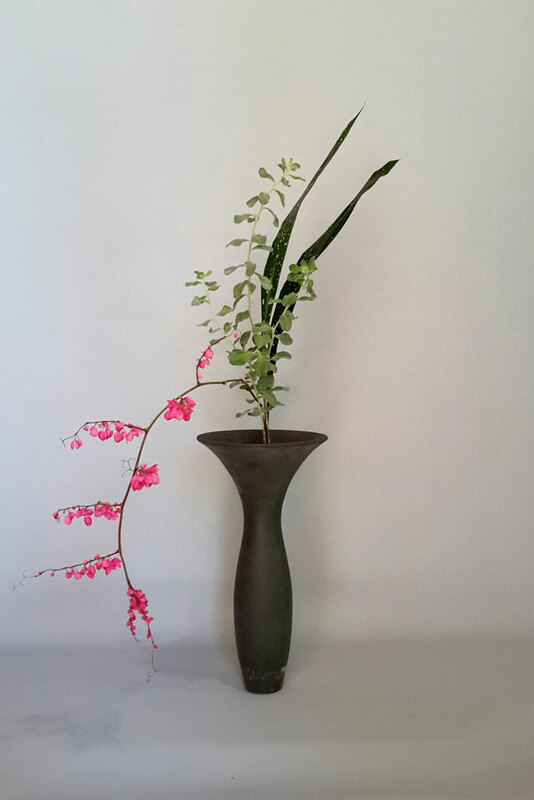 Although practicing Ikenobo ikebana is a life-long pursuit, diplomas are awarded along the way, first for student levels, later for instructors, and eventually for professors. Ikenobo recognizes eighteen diploma levels.